Summertime!!! and that means BBQs, Beaches, Bach’s & of course Wedding season!! And whilst its all about Weddings & Love & Romance one of the great things about working in the Wedding industry is the people I’ve met & the friends I‘ve made. Working with these fantastic people is an absolute pleasure, so when I was asked by Gayle at My Wedding Magazine http://www.myweddingmag.co.nz/ to shoot a Behind The Scenes Fashion Shoot with Chris from Dillon Photography www.dillon.co.nz and Nicki Turner from Nicki Collett Makeup and Hair http://www.nickicollett.com/ I simply jumped at the chance. This Summer shoot took us to a place I had never been before, Hamiltons Gap, SouthWest of Auckland. Well what an AMAZING spot! 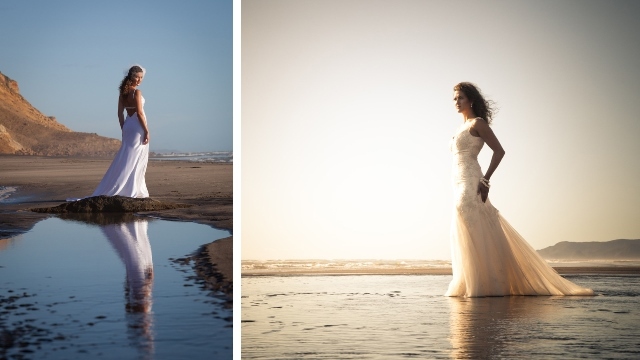 Its got the Wild West Coast look about it with a slightly tamer feel to the likes of Muriwai or Piha and provided us with a simply stunning variety of backdrops and locations in which to shoot. So Chris set out to contrast the elegance of the wedding Gown, the beauty of Claire and the Wild west coast with ………….. a parachute?? HUH? Really! Ok lets do it! …….. and this is the result!! I always admire people with vision, and in this Image Chris’s vision is truly amazing! The video above goes some way to illustrate the process of getting this parachute to look like it does, but only tells half the story. It took all of us, me included to get this shot and the moment right. The weight of the chute is nothing compared to when it fills with wind and wants to drag you onto the rocks behind. Poor Claire could barely handle the weight so it called on some ingenutiy to ensure she, and the Parachute, stayed where they were supposed to. So I downed camera, crouched into a ball and hid behind Claire’s dress holding the Parachute ropes in place with Claire, hoping like anything that Chris would get “the SHOT”. Well I think you will agree he more than got “the SHOT”. In fact i’d personally say its one of my favourite fashion shots ever. The way the water in the foreground creeps into view as if approaching to wash the scene away, and the Parachute not only captures the wind but also the light of the sunset. Claire, somehow, holds a gorgeous, almost effortless pose making holding the chute look easy. There are many “Wild” elements in the picture yet there is a calmness and beauty that contrasts this beautifully!! And what about those Balloons? Well these were certainly easier to handle and added a real “cute” factor to the shoot along with a little “rustic” feel once we got up into the sand dunes as the sun set and the light began to fade. If you know the west coast of the Auckland area you will know how wild the weather can be, how windy it can get and how challenging the conditions can be even if you're only trying to sunbathe, let alone conduct a Fashion Photoshoot!! 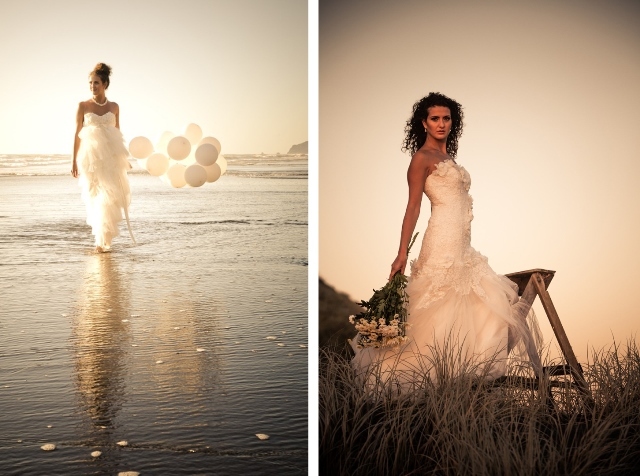 But the Day turned it on perfectly, Sunlight, enough wind to fill a parachute without taking us to the Coromandel by mistake, warm and glowing light, a sunset, calm seas, a beautiful model and a simply amazing team and a heck of a lot of fun! !